Submersible, fully waterproof LED fixture designed for baitwell tanks and courtesy light applications. Smaller, brighter and more efficient than any competing underwater light - period. This is an independent full functional RGBW (color changing) light that can also be added to an existing EOS SMX153 color changing system. Smaller, brighter and more efficient than any competing underwater light - period. At just 2.75" diameter, these little guys can be fitted nearly anywhere on the hull. Smaller, brighter and more efficient than any competing underwater light - period. At just 3.75" diameter, these little guys can be fitted nearly anywhere on the hull. The Lumishore Ora Series THX203 is an ultra slim thru-hull underwater light with shaft of just over 5/8" diameter, 3.75" long. 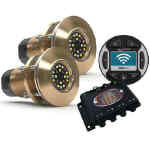 Starter Packs are a great way to get all of the required components for your integrated lighting system in one pre-packaged kit, then simply add the number of lights you need to create the perfect lighting system for your boat. The Lumishore SMX102 is the largest and brightest of the Supra Dual Color Surface Mount models. 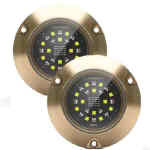 It may be used with a simple on/off switch or use the Lumi-switch to take advantage of full functionality. The SMX22 is the smallest of Lumishore's Supra Surface-Mount dual color underwater lights. 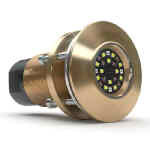 It is highly recommended to use the Supra SMX Lumi-Hub when creating a system of more than two lights. The Lumishore THX1602 is the biggest and brightest of the Supra Dual Color Thru-Hull UW Light range. 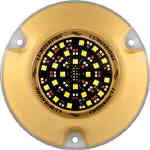 The Lumishore THX402 is the smallest of the Supra Dual Color Thru-Hull Underwater Lights. 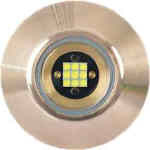 The Lumishore THX802 falls in the middle of the Supra Dual Color Thru-Hull UW Light range. The Lumishore TIX1602 is the biggest and brightest of the Supra Dual Color "Interchangeable" Thru-Hull Underwater Lights. The Lumishore Interchangeable Thru-Hull is designed for those owners who prefer the integrity of a thru-hull installation with the peace of mind of a removable LED array that can be serviced from inside the boat. The TIX402 LUMICAM is a High-Definition underwater camera with features not seen before. 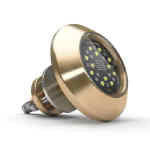 The Lumishore TIX402 is the smallest of the Supra Dual Color “Interchangeable” Thru-Hull Underwater Lights. The TIX402 EOS is Lumishore's smallest thru hull color changing underwater light that also features an integrated (interchangeable) driver. The Lumishore TIX802 falls in the middle of the Supra Dual Color “Interchangeable” Thru-Hull Underwater Lights. 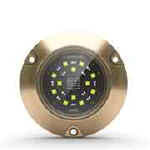 This is a single Master SMX152 EOS color-changing surface-mount underwater light fixture. This is a single Secondary (i.e. slave) SMX152 EOS color-changing surface-mount underwater light fixture. Up to seven Secondary fixtures can be installed with a single Master unit. 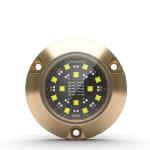 This is a single Master SMX92 EOS color-changing surface-mount underwater light fixture. This is a single Secondary (i.e. 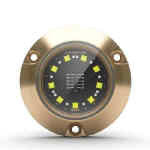 slave) SMX92 EOS color-changing surface-mount underwater light fixture.